The CD36 antigen (platelet GPIV) is a generic term for a family of glycoproteins with molecular weights ranging from 78 to 88 kDa. This molecule is found on platelets, endothelial cells, monocytes, and some human tumor cell lines. It is a very early marker of erythroid differentiation and mediates the adherence of platelets to thrombospondin and collagen. 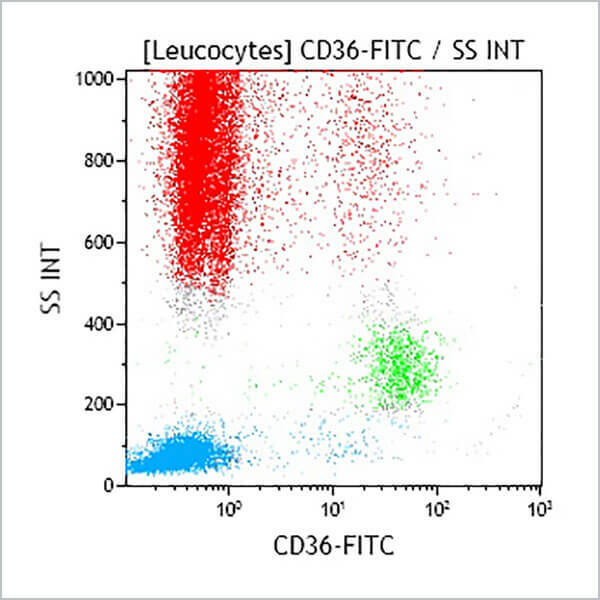 Clone Description The FA6-152 monoclonal antibody, raised against fetal erythrocytes, recognizes the CD36 family of antigens on platelets and certain hematopoietic cells. It does not react with lymphocytes or granulocytes. It reacts with both fetal and adult monocytes, megakaryocytes, platelets, and with reticulocytes.